TAS 402: (Hot Seat) How to Get Steady Sales in Competitive Category and Improve Rank? It’s time for another Hot Seat session here on The Amazing Seller Podcast! Join Scott and Chris as they go over a product listing from a TAS listener like you! You’ll hear them go over topics like minimizing PPC costs and maximizing organic sales, selling products that cater to your social media following, product listing optimization, keyword strategies, and so much more! There are so many valuable lessons that ecommerce sellers can learn from this in depth episode – what the guys cover on this episode could be the one piece of insight you need to take your business to the next level – don’t miss it! It’s the goal of every ecommerce seller on Amazon to eventually get to the point where they are able to minimize their PPC costs and see a rise in their organic sales. Are your products performing at the level that you had hoped to see at this point in the process? What can you do to move toward more organic sales growth? On this episode of The Amazing Seller, you’ll hear from Scott and Chris as they go over a listing from a TAS listener like you. The guys walk through what it takes to enhance your PPC strategy and work toward organic sales. To hear more on this subject, make sure to catch this episode! Is your product listing in the best shape to go toe to toe against your competitors? Do you have a solid checklist that can help you evaluate your product listing to make sure you have its position for maximum profitability? On this episode of The Amazing Seller, you’ll hear from Scott and Chris as they walk through what they look for in a fully competitive and optimized product listing. Take it from these guys, they know what to look for and how you can make subtle tweaks that will put your product above the rest. Learn more by listening to this helpful episode! How is your keyword strategy performing for you? Would it be helpful for you to get some insights and tips on how to improve it for optimal results? On this episode of The Amazing Seller, you’ll hear from Scott and Chris as they dive into the best strategies for making keywords work for you! Don’t let something like a faulty keyword strategy trip you up. Even if you think you’ve got it all figured out, take the time to hear what Scott and Chris have to say – it could end up saving you lots of trouble down the road! One of the biggest enemies of success is fear. Are your fears dictating your plans? Are you reacting to your fears or are you putting them in their place? An old proverb says, “If you want what you’ve never had, you’ve got to do what you’ve never done.” Fear wants to hold you back but success and growth call you push past that fear! On this episode of The Amazing Seller, you’ll hear from Scott and Chris as they explain how adopting the mindset of pushing past your fears can lead you to untapped growth and success. If you’d like to hear more about this subject, make sure to listen to this episode! [6:00] Chris reads an email from a TAS follower like you. [12:00] Minimizing PPC and maximizing organic sales. [17:30] Creating a product that resonates with your audience. [27:00] Choosing the right keywords to use. [32:00] Don’t be afraid to test changes. …my good friend Chris Shaffer back on and we’re going to do another hot seat. I know you guys love the hot seats that we’ve done in the past and now we’re going to do another one here for you and this one here is, well the question really is how to get more steady sales. I’m going to have Chris read through the email that we received and then we’ll just start to dig in. Chris, what’s up man? How are you doing? [00:00:37] Chris: Oh man. It is a good morning brother. We’ve chatted a couple of times this morning. Not necessarily about podcast stuff but just about life in general and that’s a good way to start the day. [00:00:48] Scott: A lot of things going on. [00:00:49] Chris: I know and it’s been an absolutely crazy like two weeks and it’s not even Amazon related. It’s not related to the new brand which has been kind of our big push for the last few weeks in terms of what’s made it crazy. It’s like everything else that we have going on. For those of you guys that don’t know we have a whole bunch of stuff going on. We don’t just sit around and podcast all day. We actually do stuff. We do the business stuff too which is a lot of fun for us but as you guys all know it’s also a lot of work especially when stuff doesn’t go quite the way that it’s supposed to and stuff gets thrown at you. But it’s all good, it’s all fun. [00:01:25] Scott: It’s one of those things. Allow me to cut you off. It’s one of those things where people they’ll say, “I’m about ready to give up with Amazon because it’s just like every second there’s something new or there’s a problem or this that or the other thing.” But I’m telling you what, you can go right down the road to the car dealership and I bet you they got all kinds of problems going on over there. You can probably go down to the local dry cleaner place and they probably got their own set of problems going on. It’s business, we have to adapt, we have to learn and we have to grow. I think that’s what I want you guys to take away from these hot seats is us diving into someone else’s business which we’ve done live before in a live room like actually seeing people in person, which is a lot of fun. But we’re going through the same stuff Chris. We’ve got things that are happening right now. We’re just going to be getting some inventory back in stock after we ran out which is a good thing but it’s also a frustrating thing. We’ve had listings that have gotten… Basically that have vanished and then you lose your reviews and then they come back because we had to get on the phone with Amazon. Like all of those things but in the end we’re okay with that. It’s part of the process and we’re learning also because if something happens also you know it might not be normal but yet it’s something that’s happened to someone else and then you just learn through this process. I’m okay with it. It’s part of the game. It’s part of the process as I’ve said before Chris. [00:02:51] Chris: It absolutely is and it’s funny. I go to the grocery store a few times a week. I’m just one of those people I like buying fresh produce. I hate having old produce in the house because it feels wasteful to me. I go buy fresh veggies every couple of days. I’ve lived in my new house for about a month at this point. The lady at the grocery store that’s always at the checkout already knows me by name and she calls me the ‘avocado guy’. I’m one of those people I inherited from my mom, I talk to everybody all the time. I’m standing there talking to her and she said, “Why are you always so happy?” She said, “What do you do that makes you so happy?” I tried to explain like Amazon and the stuff that we do in TAS and all the stuff. She said, “That seems like a lot of work. Isn’t that stressful?” I said, “It can be.” She said, “Well then why are you so happy?” I said, “Because there’s no point in letting it stress you out.” Like, do I still get stressed? Absolutely. But that’s when I leave to go to the grocery store and like get out of that mindset, come back at it with a fresh set of eyes because when you’re stressed out it’s not helpful to the situation. She got a good laugh out of that and I found that amusing as well because she said, “Isn’t that a lot of work.” I said, “Yeah but it’s still fun. It’s fun for us.” That’s how you have to look at it. Look, things can get you down. Life can get in the way, business can get in the way. Software which has been our problem in the last week can get in the way but letting that stuff bother you for longer than five minutes doesn’t help the situation and so if you can figure out a way to change that mindset and come back at it with a fresh set of eyes that’s always the best way to do it. That’s exactly why we do these hot seats Scott because we get to look at other people’s business with that fresh set of eyes and hopefully get them out of their rut by sharing with them what we see. [00:04:33] Scott: Yeah. What we see and maybe even a little dose of reality. [00:04:38] Chris: Which is always welcome. [00:04:41] Scott: Yeah. It’s funny. I just recorded an Ask Scott session and it will probably air tomorrow, this coming Friday, whenever you’re listening to this it will be the following Friday or the Friday after this, whatever I’m trying to say here Chris. It will be your next episode. But yeah, I was talking about expectations. Like a lot of people just don’t have the right expectations. They either think too much or they don’t think enough as far as what they are going after. In this case you might be in this hot seat that we’re going to dive into and we’ve kind of went over it a little bit but the expectations might be a little bit more than you’re going to receive without a huge amount of work. Then you got to decide when it is time to just pause this or liquidate and move or is this still maybe dabbling in. That’s what we’re going to be touching on here today but expectations are a big thing for people to understand. But let’s go ahead and dive in. Chris let’s go ahead and like dig into this stuff. Guys if you want to download the transcripts, the show notes, you can always find them at theamazingseller.com/402 and you’ll get all the links and the show notes and all of the banter back and forth between myself and Chris. So, Chris why don’t you read the email because you’re just better at reading. Why don’t you just go ahead and read the email. [00:05:57] Chris: Now, we’re setting expectations. [00:05:58] Scott: Yeah, big ones by the way. [00:07:05] Scott: Chris before we keep reading here, let me just… I want to jump in because I think this is a good spot to jump in here. He’s already said that, I have to give a pat on the back because you’ve already went out there and you’ve taken action and you got two products up and you are going through the process and you’re learning a ton through this process and you’re getting sales when you do promotions and guess what, you know how to run ads, you know lightning deals, you know outside promotions et cetera. I just want to highlight that. You’ve learned a skill that you’ll always have now. That’s good but with that all being said the first thing that I’m thinking Chris, forget about ranking for a second, is you’re getting sales when you do these promos meaning you discount or a lightning deal which again is a discount. You’re getting the deal or you’re getting the sales from deals and then when you do start to rank you start to lose so that goes to show me either price or you might not have enough of the credibility in the space that you are with reviews because you’re now competing on equal ground not on discounted ground. Does that make sense Chris? [00:08:18] Chris: That makes perfect sense. [00:08:20] Scott: Yeah, I just wanted to highlight that right there and I know we’re going to dig in more to his numbers and all that stuff but with that being said just from hearing that I’m like okay, you do well when you discount, you do fine you just said that but once you start to rank you start to lose and that tells me number one, there’s not a lot of difference there but then also people are buying when you’re equally as far as price goes they’re probably looking at reviews. This could be a review driven product and if that’s the case you’ve got a lot of work to do and we’ll talk about those numbers here in a minute. Go ahead Chris. [00:08:54] Chris: That to me is also a thing which if he’s running promos or he’s running ads and he’s getting sales why not run the ads all the time and that to me means he’s probably not profitable and he actually dives into that a little bit there. He may not have the margin to do that. He said, “I optimized my listings, pictures, keywords, back end keywords et cetera. I optimized my ads running at 4.2% click through rate,” which isn’t bad. “24.5% ACOS,” which is usually pretty good, “And 150,000 impressions as at right now. I ran a deep discount for a few weeks trying to get ranking almost impossible for my main keywords. However I’m ranking number two in my sub category. I did this like you guys recommended in one of your podcasts. When I first launched the product four months ago, the market was fairly new. There weren’t many products and most people had less than 100 reviews. I’ve been watching a few competitors very closely. One of them had a head start on me. He ran his product discounted and shot to the first page. This is while I was waiting for my product to ship. Now it’s almost statistically impossible to beat him since he’s in front of the page, he makes the most sales, gets reviews faster and thus stays in the first position which is why we want to try to launch correctly and get to that spot as fast as possible. I think this goes for most of the front page of my main keyword.” You’re very adamant about getting to the front page, “But I have no idea how to get there now. What should I do?” Then he goes on to talk about some of the stuff he’s doing off of Amazon. He’s doing a list building like we talked about Scott. He’s halfway through a giveaway using his Instagram account and he’s got a few hundred emails and he did update us to let us know that he got a few hundred more emails after the initial message that he sent us. Then he actually gives us his cost break down which I didn’t see when we were first talking about this. It looks like he’s making about $11 gross profit. Now that was at the higher price point. He’s since dropped it $5 which means he should be making about $6 gross profit. [00:10:58] Chris: Now, this does not include… No, he did include his cost per unit here. As long as those numbers are right, he should have $6 in margin to play with. [00:11:07] Scott: I think we can give rough numbers here. So like the selling price is right around $35 and the cost per unit is like $8 and some change and then we’ve got freight which is about $5 and then we’ve got Amazon pick and pack $4.96 commissioned $5.25 so gross profit is about $11 and change. Not bad. [00:11:34] Chris: That’s good if you can sell at that price. We’ve taken a look at his listing and he dropped that price about $5 by the way if I’m not hallucinating. [00:11:43] Scott: Yeah, it’s about $5, maybe $4. Again once we drop that $4 or $5 bucks what happens Chris? [00:11:56] Chris: Well, we lose $4 or $5 of our margin Scott. Again, that’s not bad. We have some products that’s sold between $6 and $7 but the real trick is that you need to minimize PPC and maximize organic sales then. So let’s just run the math on that Scott. If he’s selling at $30 and I don’t know that it was 25% was his ACOS. That’s $7.50. If he has what did we say he dropped it? $11 so even if it’s $4 he’s losing money on PPC there. Even out at 25% ACOS which to me means a couple of things. One, your cost per unit is way too high. To me just looking at this the first thing that I see he has the cost per unit and then shipping for the unit broken out separately. That’s almost a third of his entire selling price. [00:12:53] Scott: I was going, so now if you look at the cost per unit and then the freight it’s technically costing almost $15 a unit. [00:13:01] Chris: Right, which is very, very high especially when you tack on the $9 or so on Amazon fees. Let’s call it $15, that’s a multiplication not addition so $24 in cost. If he’s selling it $30 he’s only making $5 a unit which is less than the $7 that our rough math gave us. It’s somewhere between $5 and $7 if he’s selling it at $30. Now if you can sell it at $35 which is where he initially had it priced you’re in the black. You’re making money even running PPC 24 hours a day, seven days a week. My first question for Josh if we had him in the hot seat would be, “Josh, was that 24% ACOS happening at $34?” If that 24% ACOS was happening at $34, even if you’re selling a few units a day, it’s profitable. If all else failed and you could continue at $34 to sell that unit through PPC and make $5/$6/$7 a unit, let’s just call it $5. If you made $5 a unit you’re coming out of that with a profit at least. Even if it’s slower moving that he thought it was going to be. Even if you have to end up paying a little bit of long term storage fee or something just because it’s selling a handful of units a day versus the 10/15/20 or 100 like one of your competitors is selling. You’re still making a profit on it. If you’re at that 24% ACOS at $35 if nothing else works go back to $35, run the PPC. It’s kind of my initial take on this. [00:14:38] Scott: I guess that’s where I’m at too but then I guess the next question is like that’s all fine and it’s something you can technically do. You don’t know how long that would last but we want to basically get organically found now. That’s where the challenge comes in for me from what I’m seeing because we’re looking at over three thousand people selling a very, very similar product. I looked at the results on the main keyword. It’s about 3,000 and then from there it’s like you and I said Chris, this particular product there’s not much that you can do to make it stand out other than adding an accessory which everybody is pretty much already done but the only other way that you could do this if you wanted to position it towards another market. Meaning if you were able to figure out that a market was using this type of product and then you were calling yours out as being specifically designed for that market and now you could target that market and then you can go after those sales. That’s the challenge here I see because I see that even if we get… Like if you said Chris, if we can do that by driving traffic and we can get sales, that’s fine. Once we get to page one and now we are competing… And to get to page one we’ve got to be able to sell, some of them are selling like 2,000 units a month. So if that’s the case we got to sell a lot of units to get on page one. Let’s even say that there’s someone that’s getting 600 sales a month and they’re on page one. We still got to be able to get that amount of sales to get to page one for that particular one. Now I see you put up a search term and you got about 1,800 results. [00:16:25] Chris: This was the one that he said is his main search term. [00:16:28] Scott: He’s about 1,800 results but still you have to be able to get that amount of sales in order to get on page one and if you do what is then going to then stand out. What I’m also noticing is that reviews, the ones that have more reviews are generally the ones that are getting more sales. You have one seller that’s got 2,175 sales, they’ve got 1,252 reviews. How many reviews does he have by the way? Do we know that number? [00:16:54] Chris: Let’s find out. 55. [00:16:58] Scott: I know myself and not even myself, my wife she’s going to these types of products and she’s’ going to start looking at reviews for this type of product because those product could have some things that could go wrong in it. [00:17:28] Scott: Again, that’s what I would like to talk about next because I think there’s other products that could serve the market that he’s going after better than the market that he’s picked. [00:17:37] Chris: That’s exactly where I was going with that. Not to say that they wouldn’t buy this. [00:17:41] Scott: No, you can still have this product and you can probably sell it like you said because now it’s part of your product line. I’m not saying it doesn’t go with your product line but I think you could sell something that’s more specific to the audience that you’ve created on Instagram with over 2,000 people that are on there and a little email list and I think you can probably email list created faster if you had something that was targeting more of a specific audience. The thing that you have can be used in that market but it’s not necessarily going to just fit that market. Does that make sense Chris? [00:18:17] Scott: So by looking at the Instagram page there are other products that you could do as far as to this market and they would fit really well but the other thing that you’re selling could also go well with it. So you don’t have to go away from the brand that you’ve started I just think that you need to look at other opportunities in that space that could be positioned better. That’s where I would start to go. [00:19:23] Chris: We had a sneaking suspicion. [00:19:25] Scott: Does this product drop any time of the year for a long period of time and the answer is yes, it does. It’s like imagine selling ice cream cones in the winter. They are not going to sell. Or a shovel. Like I’ve used that example before. A snow shovel is sold in the winter for maybe two months, maybe three. Maybe, but then after that it dries right up and that’s pretty close to what can happen with a product like this. I would probably look for a product that can be a little bit longer during the year and then this can be a bolt on product to that. That’s where I would probably start to go, I wouldn’t give up on this. I think that you have a good start and you have got a little good product and you’ve got data and you’ve got pay-per-click stuff. I would probably even look through the pay-per-click search results and see also what people are searching for to find it and that may help me position the product even better just with that. [00:20:24] Chris: I agree with that completely and I think there’s are a couple of things. One, you can continue to build that audience. With this audience there’s going to be probably a four or five month period that is going to be 80% of your sales in a year in this market. I would think and so if you can build that in the off season which is coming up for that stuff next year is going to be a huge year for you if you’re still doing this. It’s a question of making it profitable right now and then seeing if we can pick some of those sales in the off season to sell through this inventory and continue to make a profit. Scott, we already kind of told Josh the first thing that we might do if nothing else we could raise this back to 35 bucks and sell it at the 24% ACOS through PPC even if it’s only two, three, four units a day and not the thirty that some top competitors are selling but just taking a look at the listing, I think those pictures look pretty good but the title was something that stuck out to me. Did you have anything you wanted to share about the title versus some of his competitors? [00:21:29] Scott: Yeah, well number one in there including some things in there that don’t necessarily have to be in there. You kind of highlighted it for me. People can’t see this but I can see what you’re saying but there’s… When you’re not explaining exactly what the product is and really just leaving it at that, you don’t need some of those other… If you’re selling something you don’t necessarily have to put in there ‘New’ or ‘Brand new’ or words like that. They don’t really help sell the product. I think if they’re buying it on Amazon they pretty much know. I wouldn’t include that. [00:22:13] Chris: I think some of the reason that that’s included is because he’s saying it’s a new design for this year. [00:22:18] Scott: Well then why don’t we say new design? [00:22:20] Chris: That’s kind of what his competitor is saying. [00:22:23] Scott: Why don’t we put the year in there? Why don’t we put the year so that way there they know what’s coming, not just ‘New’. It could have been new in 2014. If we’re going to do that say, “New design 2017, updated.’ Something that let’s people know or what’s the other word that people use when something has been… You want people to feel as something has been improved. Improved design. Improved design 2017. [00:23:04] Chris: Which he has kind of in here but you might want to just drop the year in there. To me, again like he knows who his audience is. It might just be a question of positioning his title towards that audience. So instead of just saying garlic press, it’s improved design garlic design specifically for chefs. That maybe a way of calling out his audience, even in PPC or when he sends an email or posts it on Instagram that it calls out to the Chefs immediately. Look, this is designed with a chef in mind. It’s not for your average person and it doesn’t necessarily filter those people out but it makes the people you’re trying to target feel special and they are more likely to buy it then. The biggest thing for me I think that’s his problem, he has okay bullets and an okay description. It’s not great, it’s not bad. He is using enhanced brand content which I like but to me I think his biggest problem is probably just sales velocity. Would you agree with that? [00:24:03] Scott: Yes, absolutely and again how much work do you want to put into getting more sales to get you to rank? That’s going to be the question or like you said repositioning it so you’re getting sales on the keywords that will convert even though you don’t necessarily need to call it out to everyone. [00:24:23] Chris: He said, when he did an external promotion he got to number two in his subcategory. He’s actually in the correct subcategory. The number one competitor is in a different subcategory so this is a case where he says, “I got to number two, why didn’t my ranking go up?” Well number two in garlic press doesn’t necessarily mean that you’re selling the same as number two in knife organizer. That might be a much more competitive category. So his main competitor may still have been selling four, five, ten times what he was selling in a day. We know from some of the testing that we’ve done that Scott if you’re selling a garlic press and I’m selling a garlic press, if you’re selling 11 I need to sell 12 to take your spot on the listing. That would be one of those things. The other thing that some of his competitors are doing that is going to bolster their position in that market is they have variations. Now, Josh is selling the most common variation, most popular variation from what I can see, which is where he wants to start but the other thing that he needs to keep in mind is if somebody has variations, well Amazon isn’t necessarily looking at the stainless steel garlic press sales. They are looking at the rubber handle and the plastic sales as the overall sales for that listing. Does that make sense? While the child listing is what ranks like the individual variation is what technically shows up in the search results. Amazon is smart enough to know that there’s other products attached to that. So when you’re looking at sales velocity you need to take that into consideration as well, so if you’re selling eleven on one and twelve on your rubber handle garlic press and I’m selling ten I’m never going to match you. I would need to sell twenty four a day to match or beat you in terms of the organic rank and sales. The other thing that plays into that something we don’t talk about as much is going to be your conversion rate. That’s why something like PPC is helpful because we’re driving high converting traffic especially if we’re converting at 24% ACOS. [00:26:25] Chris: It means that we’re getting a pretty decent conversion rate out of that or we’re paying very little per click but either way I’m going to try to make sales that way. So what I would probably do if I was Josh is take a look at some of the competitors’ titles like we normally do. Make sure that we’re including all of those different types of keywords that were not necessarily in here. There’s some different ways and I’m trying to think how to describe this but there’s different ways to describe it that he’s not necessarily using. Scott, you’ll see the two that I just highlighted there. He’s using a different variation of one of the words and that may make a difference as well. Do you have a good example for that or I might just have to drown on this one? [00:27:10] Scott: Ah, you might drown on that one. Yeah, you could reference if… There’s different ways to talk about sizes so you can say it in like inches. If I said how many inches are in a foot, you can either say a foot or you can say 12 inches or ounces. You can say 16 ounces or you can say a pound. If someone searching for 16 ounces something that holds 16 ounces or something but you’re saying well it’s just a pound. Someone isn’t going to find it necessarily if they’re searching for a pound, if that’s what they search for. They’re not going to write pound. [00:28:03] Chris: That I think is the perfect example Scott. I recorded an audio answer for a PLC student the other day on something very similar to this and they’re like, “Well, doesn’t Amazon pick up plurals?” It was kind of like this example where the plural is not the same thing as adding an S to it. It is the same thing as like ounce versus pound. Yes, Amazon knows like in theory Amazon knows ounces and pounds can be converted but their algorithm isn’t going to go out and say, “Oh, 16 ounces is a pound,” so if you say one pound or one LB, which is a totally different… That’s the abbreviation of that. Amazon doesn’t necessarily know that one pound is the same as one LB. You need to take like the way the people are describing things into consideration as well. It’s a subtle difference but it will be worth a test. [00:29:03] Scott: Here would be something that I would do and I would recommend anyone doing. Go to Google Planner or Google keyword tool, whatever you want to call it and go in there and type in your generic term, garlic press. Start to see what people are searching for. Are they searching for different sizes of it, maybe you’re going to find out that the six inches is being searched. Well then that can be something that you would want to include. Again we’re not looking at Amazon numbers necessarily. Now, merchant words supposedly does give you some Amazon data. I’m not quite sure or how or how it does it but that would be another tool that you could use to get some ideas and inspiration for different abbreviations or different terms that they’re using with that one thing. Like so stainless steel garlic press that’s fine but what if it was a six inch stainless steel garlic press and we knew people were searching for that exact term and I was going to be able to use that, that’s going to help me when someone searches. That’s what we call long tail. Again, having the right thing in there, not just guessing or even just something to test is worth looking into. So Google planner tool. There’s other free keyword tools out there that you can check out but you just want something to start to give you ideas of other abbreviations or terms that are being used within that product. [00:30:27] Chris: As we were talking about that, I went back to the search results page and I know you guys can’t see this but I’m going to show it to Scott. There’s six or eight different ways to talk about the size of this and they’re all being used by different people. So it may be worth looking into seeing which one of those is going to drives it. They are using LB, they are using pound, they are using the pound symbol. But I don’t see any of the top sellers using the version that he’s using. [00:30:58] Scott: Yeah, I’m looking at that as well. [00:30:59] Chris: So it maybe one of those thing. It’s soda versus pop, like if everybody calls it soda or 80% to 90% of people are using for soda, I’m going to call it soda whether I call it soda myself or not. [00:31:12] Scott: Or if you’re from the south and you’re talking about sneakers, it’s tennis shoes. I didn’t know that till I moved to the south. Or sweet tea. Chris, I do want to keep this to our normal 30 minutes but I know we’re over a little bit. Is there anything you wanted to wrap up with we can give him some additional, maybe some recap on what he should probably do at this point. [00:31:38] Chris: Yeah. I think he has margins. I would focus on where the margin is. The first thing I would do is test some of those title changes, take a look at some of your competitors’ bullet points and this is something that we always say. Everybody always tells us that that their listing is optimized and we all like to think that. I recorded a video for the class Scott a couple of weeks ago. Look, Scott and I get this wrong too. We take our best guess out of the gate and put it up and then we have to test. 99.99% of the time we were wrong. We missed something somewhere that actually improved our sales by 10/15/20/25%. They added five or ten units a day when we made one small tweak to the title, one small tweak to the bullets. Even though we got our feet under us to begin with there’s a different way to describe it, there’s a different way that people are searching for it and we find that as we start to refine everything. That’s a step a lot of people miss. A lot of people, and we have this conversation a few times a week with people, and every time we have a lot of them we have this conversation think that they can put their listing up and then stop worrying about the title, stop worrying about the bullet stuff, stop worrying about the description, stop worrying about the search terms. To me that’s kind of your starting point. That’s everything that we’re testing against. We should be constantly looking for things. Dom and I got into a power hour about the importance of split testing but the reason I like split testing is exactly that. If I I’m right out of the gate, nothing changes. If I’m wrong out of the gate, everything changes and I can take a product that was mildly successful or slightly profitable and scale it very rapidly and so if he tests a few of those different things I think that will help. The second thing is I would probably price this and he’s mirroring the main competitor but when you look here a few of his competitors are selling the same product at a much higher price point. [00:33:32] Chris: They are ranking, which means they’re selling and when we look at Jungle Scout it means they’re selling so at that $34 or $35 price point especially if he can make sales via PPC and he can consistently get that 24% ACOS which for most of you guys out there that’s pretty good. We typically, Scott say ball park average our products are between 30% and 40% margin which we mean if we can get 24% ACOS on PPC we would run that all day every day as much as Amazon wanted to eat. We would just keep feeding it because we’re profitable even if it’s only at a dollar or two or three per unit, we’re profitable on those PPC sales and each and every single one of those helps us rank organically. So if nothing else works you should be able to move through that inventory using PPC. Now the other thing I would say is watch for the drop Josh. The drop is a blessing and a curse for you. The drop in my opinion, and Scott I want to get your opinion on this, there’s going to be a drop in sales in this product in the next few weeks. It’s probably already started. If this is a product that you want to keep going with, if this is an audience that you want to keep going with, you have a massive opportunity right now to knock those competitors out and to be in place for next year. Whether you do it right now or whether you do it before the spike in sales for this product starts in March or April next year whenever that is, take a look at Google Trends Josh and see when that is. [00:35:36] Chris: If you’re willing to put in the effort, you’re willing to put in the hustle, you’re willing to put in the grind and build this in kind of the off season you can have a heck of a year with this product next year. But it’s one of those things where you have to make that choice for yourself. You know exactly what’s going on in your situation and I would also say the audience is fantastic. I think you’re doing a good job with building that out. Look for some other potentially low cost products and see if you can launch those as well. I would also look to see if you can bring your cost per unit down on this if you’re ever going to re order in the future because that is the real achilles heel of the product here. Does that make sense Scott? [00:36:12] Scott: Yeah, makes total sense and I think that’s some good advice and I just think that especially with this being a seasonal item that you hands are kind of tied as far as how far you’re going to push it but like you said Chris, you’re going to have the advantage of being able to push sales when you have to because you’ll have it dialed and you’ll have it figured out but me personally I would look at this as an additional product that I can offer and I would then start to look at other products that could be less seasonal but then also that could fill in those times but the also be less competitive. This is a very competitive space and there’s not much differentiate yourself with this one product. I would try to find those other products that are low competition, meaning low reviews. You don’t have thousands of reviews and then from there I would try to push those products with all the principles that you have already learned. Remember we’ve learned new skills. You can go ahead and take all of those lessons and apply it to that next product and then from there you can blow that up. And then this would be another product that could be serving the same market and who knows, you could probably do a really good job by adding this as some other type of promotion whether that’s on another product that’s doing well or even on your email list. There’s a lot that you can do with it. That’s what I would say and I would definitely look at the title. There’s one word in there that like you said Chris, that could probably be changed. I don’t know if that’s going to make a huge difference but it could be. I looked in the bullets and I think in the bullets it was the right way that I would like to see it. But other than that I don’t think that the bullets and the title is going to be the answer. I think it’s going to be being able to find that balance so you can push sales and then get ranked but then in order to get ranked and then get sales, I think reviews are going to play a part in this. That’s why it’s a challenge. I’d start looking at that next product that’s going to serve that market more directly and then use this as an add on product. [00:38:12] Chris: I think that’s fantastic. [00:38:14] Scott: Cool. That was good. I love these. Guys, we do these live every now and then at a TAS Breakthrough Live Event. Chris, do we have that page available so people can register or if not can we have that ready? [00:38:27] Chris: It should be theamazingseller.com/live. [00:38:48] Chris: It is live right now. [00:38:49] Scott: What we do is we get into a room together for an entire day, sometimes two days and we get people on a hot seat just like this and we break down and kind of break down the business and work through some of the sticking points, the struggles and everyone gets to chime in and it’s really a lot of fun and we really enjoy it. If you want to get notified when we do an upcoming live in person event, head over to theamazingseller.com/live and you can get on that early list and that will give you those notifications. Chris, that’s going to pretty much wrap it up. I think we did good here. We generally gave ourselves 30 minutes to do these. I think we went over a few minutes but we had a little bit of a banter back and forth in the beginning. [00:39:29] Chris: We’re out of shape. [00:39:29] Scott: Yeah, we’re out of shape. We haven’t been practicing. All right. Cool. Guys, you can get the show notes at theamazingseller.com/402 and that will get you all the links, the transcripts, all that fun stuff and just understand guys, you’re learning through this process, everything is not going to be a winner but if we can just continually learn and continually grow, things will always get better and will get better as we move forward. That’s it guys. That’s going to wrap it up. Remember as always, I’m here for you, I believe in you and I am rooting for you but you have to, you have to… Come on say it with me, say it loud, say it proud, Chris is going to say it with me today. Chris you’re going to say it. [00:40:11] Chris: I’ll say it. [00:40:11] Scott: You got it, on the count of three? [00:40:13] Chris: Well, if you count to three. Is it on three, after three or is it three? [00:40:18] Scott: I think it’s going to be after. One, two, three. “Take action.” Have an awesome, amazing day guys and I’ll see you right back here on the next episode. I created a Page Just for You called…START HERE! 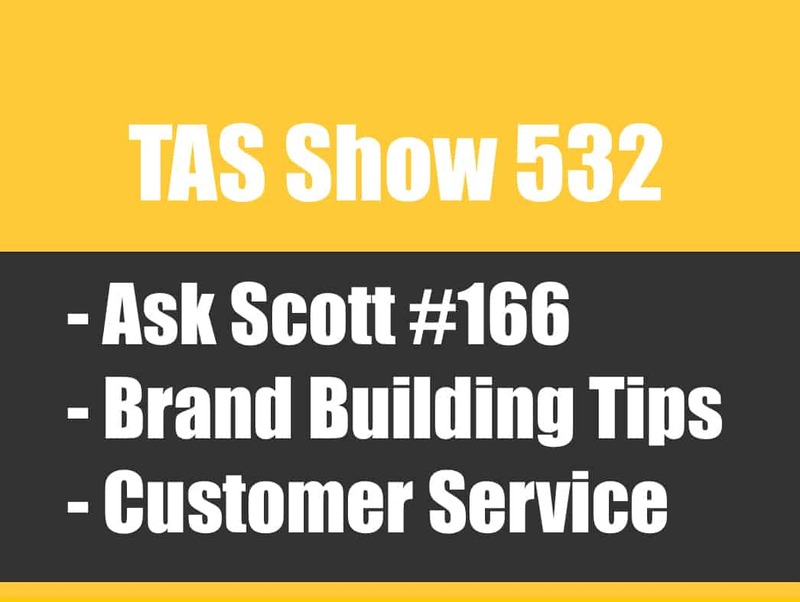 TAS 532 – Ask Scott #166 – How to Build a Brand Around One Product?